First up are Galway and the Shannon Blues. Galway find themselves one game away from repeating last year’s final appearance. The westerners field a balanced side and play a fluid style, moving the ball well when in possession. There are plenty of finishers in the forward line. Home based stalwart Kevin Cummins can be relied on to come up with a big score when needed, while given a half a step of room, Cian McMonagle can put the ball over the bar from distance. In the middle of the field Ryan Forde and Cian Darcy form a good midfield partnership, while Galway U21s Dylan McHugh and Ruairi Greene form part of a solid defence. The Blues have some players who can open things up with speed from the half back line and midfield. Brian Fanning and Brian O’Seanachain, as well as Kevin Coffey, are players capable of launching marauding attacks deep into enemy territory, while at the front end of the field, Kerry duo Kieran Hurley and Lee O’Donoghue can provide the finishes. Limerick native Josh Ryan can also mix it up on the edge of the square for the Blues. Can Galway make it two final appearances in a row, or will it be the Blues fulfilling their potential and earning a final date. The Blues might be slight favourites as they seem to be hitting form at the right time, but remember that Galway comeback earlier in the season. Will be an interesting one! One of the biggest rivalries in town, Aidan McAnespies and Donegal are sure to be firing on all cylinders on Sunday afternoon. Donegal have to be the favoured side having run the table in the league stages. There is plenty of quality in the team. Brian Donnelly is a key figure in the middle of the field, the Louthman’s presence has been key to Donegal’s success. Alongside him, and a different style of player is Stephen McBrearty. McBrearty has a great engine and never wastes possession, and there will be plenty of options up front with Ted Furman and Enda Varley sure to keep McAnespies defenders hands full. McAnespies have come out ahead in their last two outings, the last a real character test having pulled out the win after going to extra time against the Connemara Gaels. The team works hard on the defensive side of the ball and has the players to spring forward and capitalize on the breaks. Key for them this year has been Lifford native, Brian Breslin. Breslin has the speed and scoring ability that would fit into any team, while Dubliner Mick Walsh also adds pace. McAnespies will need to keep the energy levels up for the hour if they hope to turn the Donegal men, and while a win might be a surprise it is not out of the question. It is north v south in the junior B football final when Cork and Donegal meet on Saturday afternoon. Cork defeated the Connemara Gaels in the semi-final with room to spare, and might feel that this year could be the first time since 2012 that the junior B football trophy returns to rebel hands. The Cork side features heavily with American Born players. 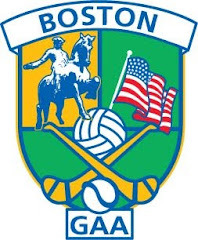 Notably Jack Lynch, whose father Mick attained legendary status playing both football and hurling with the Cork club in Boston not so long ago. The Harrington brothers, Denis and Declan, feature prominently who along with Emmet Smith, Ryan Connell, and Ryan Hayman form a contingent of 6 local born players. Captained by the passionate and quintessential Corkonian, Darren O’Donovan, Cork will be giving it their all. Defending champions, Donegal, had an unexpected win over favored Galway last weekend to make it to the final and will not relinquish the title easily. The northerners feature seasoned campaigners, Michael McGinty, Paul Boyce, and Matthew Cutliffe in the lineup. The Uris partnership of Diarmaid Moyne and Darren Grant pose a formidable scoring threat, while American born Sean Winston brings some local flavor to the side. It promises to be an entertaining encounter, with each side fancying their chances. Donegal’s junior A’s follow their junior Bs on Saturday in a semi-final when they face the Shannon Blues. Donegal were neck and neck with table toppers Cork in the standings. Donegal are defending champions for the Pat Callaghan Cup. 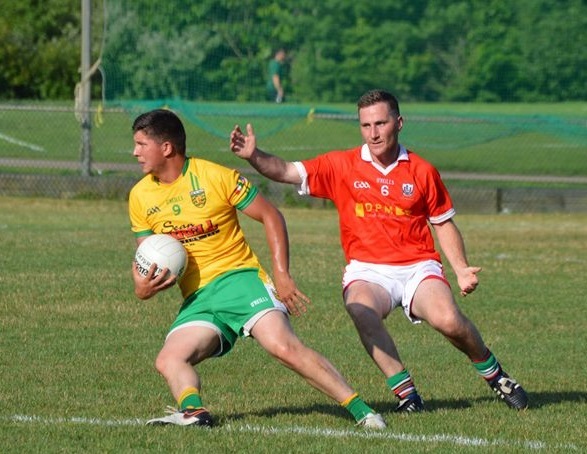 The Tir Chonaill men can move the ball quickly. With Kieran McDevitt, Ronan Diver and Sean Hume in the forward line, they will keep the Blues defence busy with some quick passing and movement. The Blues side contains plenty of experience, Conor Fitzgerald and Pat Murray are 2 local kids who are now veteran players for the Blues. Derek O’Brien and Conor Mullen are two other stalwarts that will not be happy to let Donegal have their way. This could be a hard fought contest. Cork topped the table in the regular season, and having missed the playoff last year will be eager to make the most of their chance. A team that includes the stout defending of Seamus Loftus at the back, some hard running from Colm “Bottles” Daly in the middle of the field, and the prowess of Cathail Arnold up front, will be hard to beat. Although they finished in fourth place the Gaels can put out a strong side. The experience of old campaigners Pat McNicholas and Tom Sally McDonagh mixes with the energy provided by Ian Heanue, Paddy McGee and Gavin McCrystal to give the Gaels a good balance of youth and experience. This one will be close! Tom’s meet defending champions Offaly in the junior A hurling semi-final on Sunday. For the winner the reward is a meeting with Tipperary in the final the following weekend. Offaly’s lineup is peppered with class, Rory Sludds, Jimmy Rigney, Andy McRedmond and Stephen Brown, all home based and top class hurlers will provide the backbone for Offaly’s efforts. Tom’s finished ahead of Offaly in the standings. Tom’s side features Jack Martin, a youth product playing at a high level of hurling. The scoring is likely to come from Paudge Egan and Danny O’Connell in the forward line, while James Dooley has put in some stellar performances in the back line thus far this year. The puck of a ball in this one.